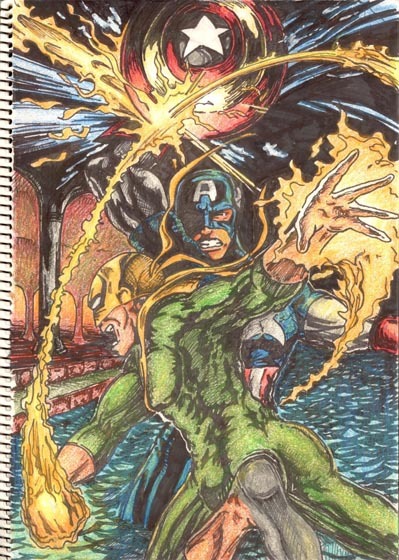 Earlier this week I posted my b&w sketch of Iron Fist going head to head with Captain America, and a promise of a little coloured action before the week drew to a close. Now with over 24 hours up my sleeve before said deadline here we go with the finished product. I'm a sucker for colouring with wax pencils - for personal work, they do an unbeatable job - even in my hands! Really liking getting back into the drawing gig, so hopefully my next one won't be all that far away. alright it's about time we get to see some of your work Dan. sorry i didn't comment earlier but i'm just coming off my busy days. Great to see you putting your work out in public again! Well done. Looks great with the color added Dan. ...so whose turn is it now? Dave's again? That's gorgeous! The shield especially Dan. It's okay if I save it, right? Cause I already did. Love it! funny you should mention that Craig. have a look at my ROM blog. i basically did something you had asked about. Thanks folks - it's great to get all the cool feedback - puts me on the feel good weekend mode already! Yip of course you can save it Random, glad I have at least one collector of my work! Wow this is flawless..Great job again Dan..Will definitely post this at the gallery blog! I saw that Dave. It turned out great. That's right IFF, I think it's your turn to post something up. I'm working on our family Festivus card and will probably post that up. Not really comic-related but who knows, my kids, the Filthy Animals could be the next team-up in the making. Craig,my only wish in this world is to draw..i dont have the talent so i rather appreciate art. I wasn't but I am now. IFF you dug up some great stuff.